Hyperkin, predominantly sellers of third party accessories, have announced their follow up to the hugely popular RetroN 3, a series of hybrid retro consoles. In addition to previously being able to play SNES, NES and Genesis games, the new console now allows the play of GBA too, though one of its most exciting new features is the HDMI output – allowing you to finally have a tidy set-up, at least in my case. As well as those, it boasts a new operating system inviting you to change the controls and pick platform, with more to be announced. 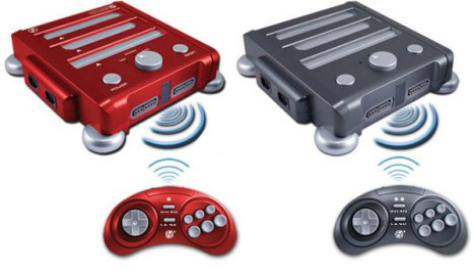 Otherwise it carries a similar design to its predecessor with cartridge slots for each console, two controller ports each and a wireless Bluetooth pad. Check out the RetroN 3 to see what we liked about it so much in our review. Hyperkin are intending to unveil the hardware at the Midwest Gaming Classic trade show in Wisconsin on March 23rd. The Retron 3 has fairly sketchy reviews on Amazon, but damn I still want one. Consolidating the mess of cables would be lovely! The primary complaints are that the wireless controllers are pretty cheap, sound emulation is off (supposedly worse on the nes/snes), and the game cases getting a bit scratched somehow. System itself seems to be just ok (in terms of not breaking). Also a small selection of games supposedly don’t work on it. But maybe the 4 will fix those? I definately will get one at some point!